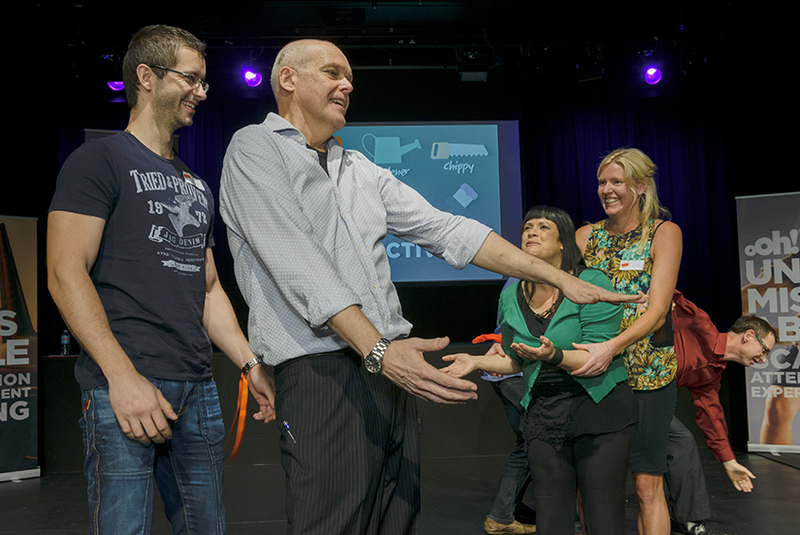 Impro Australia is the recognised industry leader in the area of corporate training and entertainment based on the skills of improvisation and Theatreports®. We conduct business workshops and training courses all across Australia. Our corporate trainers are the most experienced and respected impro facilitators in Australia. Training in the skills of improvisation will increase your team members’ ability to think quickly on their feet, to embrace risk confidently, and to deal effectively with unexpected challenges on the fly. Our workshops are energising, self-reflective and full of take-home tips for becoming a more mindful communicator. Activities are designed to create a group dynamic where participants learn to respond instantly and productively to each others input. The result is a more nimble, generous and resilient team able to generate fresh directions and solutions. • Embedding Corporate Values – exercises and exploration to illustrate key behaviours and practical workday applications and reminders. • Product Promotions – Creative fresh approaches to introducing new products and knowledge. ie. Our facilitators will assist your team to discover and articulate the essence and story narrative associated with your product through a series of theatrical challenges and activities. Participants in our training programs experience a variety of exercises, both verbal and non-verbal. We call it serious play. We employ fun physical and mental challenges to free up the imagination and promote tangential thinking. If clients have a key objective to enlisting our workshop, our facilitators will include specific demonstrations, explanations and games to achieve the desired outcomes. The skills demonstrated by our world-class performers in their stage shows are directly transferable to the business, marketing and sales arena. Our training techniques will give participants tools to strengthen and develop solid teamwork, unleash their creativity, and forge innovative new paths and relationships. Participants will identify their own strengths and discover new sides and talents in their workmates. • Change Champions – Assist in the integration of new visions, adapting to changes in environments or the reorganisation of the workplace. • Operations – Executives looking to boost staff morale, raise engagement levels and build a positive self-image and relationship with co-workers. Genuine connections made during improvised activities have proven to be influential in building trust and rapport among co-workers. • Management – Identify and practice the effective communication skills that improvisers employ to engage and bring out the best in people. Advanced listening skills exercises are ideal for honing your ability to find connections and draw out the best in co-workers. Click Here for an expanded list of the benefits of impro training. We have worked with hundreds of clients, who continue to use our services. These include: Westpac, Heritage Bank, Google, Price Waterhouse, Qantas, IBM, Apple, KPMG, Honda, 3M, Harvey Norman, Woolworths, The Starlight Foundation, McDonald’s, Hutchison, CocaCola Amatil, IGA, Xerox, Tricon, NRMA, Yahoo!, XYZ, Microsoft, Canon and Macquarie Bank.